FNTO is an organisation established to safeguard the interest of the workforce and to enhance their service propsects and social livelyhood. Close this window P & T is one of the biggest service Department and plays a vital role in the socio-economic life of the community. Its legislature base dates back to 1898 when the Indian Post Office Act was passed. 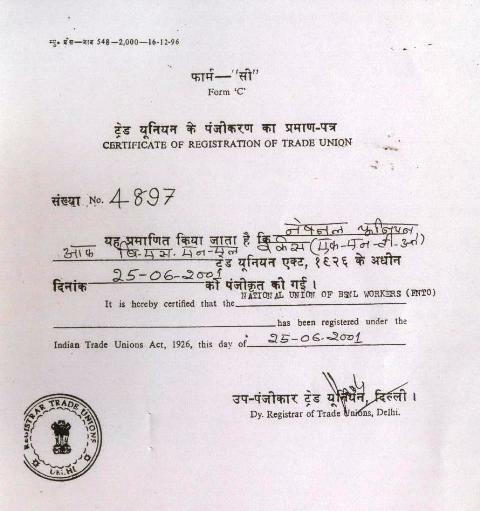 The P & T Trade Union movement is equally one of the oldest Trade Unions in the country with over 90 years history (formed in 1906).The movement in several names like All India Postal & RMS Union, All India Telegraph men Union, etc., came under UPTW(Union of P & T Workers)on 13.08.1947. Later NFPTE was born on 24.11.1954. 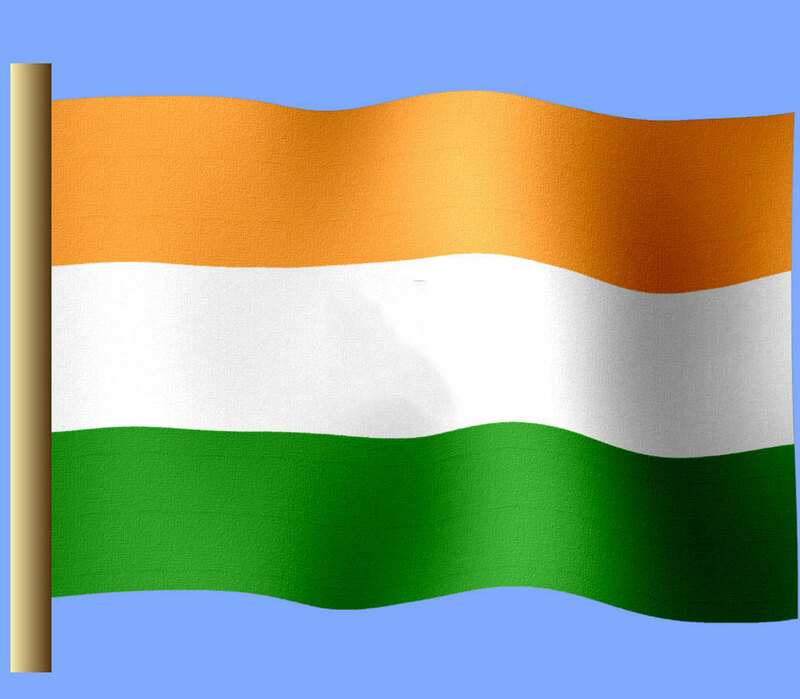 The genuine Trade Unionists who reposed undiluted faith and believed passionately in the ideals of a free and Independent Trade union democracy formed progressive Democratic Front on 07.012.1964 under the leadership of Shri K.Ramamurthi with a determination to install a free and democratic Trade Union movement in P&T. The National Union formed under the leadership of Sri K.Ramamurthi were recognized by the Government on 10.10.1968. 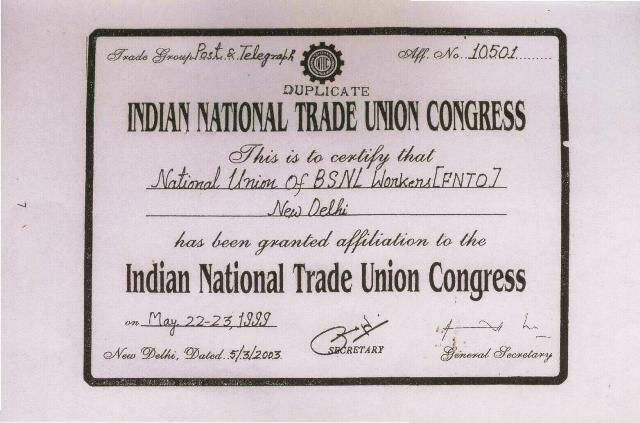 The Federation of National P&T Organisations with National Unions recognized in October 1968 and AITTMEU and others recognized on 21.9.1968, was formed on 31.10.1969. Sri Ch.Raghbir Singh, was elected as President and Sri K.Ramamurthi as Secretary-General. The FNPTO was recognized on 31.1.1970. The FNPTO was affiliated to PTTI on 1.5.1973. Consequent on the bifurcation of the Department, the FNPTO was bifurcated into FNPO & FNTO from 18.3.1986. Sri K.Ramamurthi and Sri R.Venkataraman were elected as Secretary General respectively. Sri. K. Vallinayagam succeeded R. Venkatraman and K. Thomas John became President of FNTO. 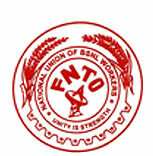 After DOTs corporitization as BSNL, FNTO with its affiliates merger formed NUBSNLW(FNTO). Sri. Thomas John and Sri. K.Vallinayagam are President and General Secretary respectively. 1. In the National Council we were able to settle many issues by our lucid presentation and by convincing the Government on the merits of our Demands. 2. Our efforts to get maximum benefits through the III, IV & V Pay Commission and subsequently after the formation of BSNL can be evaluated by the gains we have made. 3. Bonus for P&T / BSNL Employees. 4. Time Bound Promotion for the Staff. 5. Number of benefits through Departmental Councils. 6. Several programmes of Trade Union Action including Token and Indefinite Strike. 7. Establishing a reputation for the National Unions and creating a situation that no strike in P&T will ever succeed without participation by FNPO. 8. Settlement of major issues like cadre restructuring, safeguarding the staff interest consequent on Technology induction. 9. Regularisation of RTPs and Casual Labours. 10. Massive education programme for the FNTO activists and leaders with the assistance of PTTI and present Union Network International. 11. Effective participation in PTTI / UNI conferences and in the ILO Joint Committee meetings. NUBSNLW(FNTO) along with alliance partners has achieved for ALL SECTIONS of non-executive employees of BSNL so many important issues In ONLY 22 MONTHS of its recognised status That could not have been earned in 22 YEARS earlier! Infamous VRS/CRS proposals agreed upon by NFTE was dropped at the very first instance. Successfully united all Unions/Associations of executive & non-executive employees to wage sustained struggle to save BSNL & MTNL as PSUs. Govt. Compelled to give written assurances in the face of proposed Strike on 5th January 2006. Govt. Pension – undue heavy liabilities imposed unilaterally on BSNL by Govt. Removed through strong and timely intervention of our Union. LIC based Group Insurance Scheme with much higher benefits. Extension of Insurance benefits for the period from 1.8.2005 to 19.8.2005. Bank Loan Scheme at lower interest rates. Productivity Linked Incentive (PLI/Bonus) scheme introduced in 2005. We were able to improve the management’s propositions in a big way in favour of the employees. This year, we could remove upper ceiling on amount benefiting large number of employees. Arrear 25% bonus for the year 2002-03. BSNLMRS issues sorted out including enhanced scope for the retired BSNL employees. Cancellation of vindictive transfers perpetrated by NFTE. Restoration of B2 class HRA to many cities. Special Incentive for rural and un-classified areas. Restoration of maximum period of TO. Continuous diversion of outside quota for promotion of qualified TTAs to JTO. Concessional Telephones to new recruits. Number of Free Calls to all non-executives increased. Departmental Examinations for promotion to higher cadres restored. While commencing our web with effect from 09.11.2007, I have pleasure to state that the aim of making the web easily available to all our viewers will be achieved and we will have more viewers We will endeavour to make it lively with latest updates. The space for Web is hosted by Mr.N.R. Hegde, AGS FNTO CHQ New Delhi and Secretary, Union Development & Organising Centre, 6/2, 1st Main, next to Kodava Samaj, Vasantha Nagar, Bangalore 560052 Ph: 080-22355959. You can send your opinion suggestion for improvement of the web.